On Any Given Sunday, a hero can fall, and a hero can rise. The Miami Sharks, once one of the best franchises in their football league, have fallen on hard times. They aren’t a profitable franchise anymore, and owner Christina Pagniacci (Cameron Diaz) is contemplating moving the team. They’ve lost four straight, and Coach Tony D’Amato (Al Pacino) has just lost his 38 year old quarterback Cap Rooney (Dennis Quaid) to a debilitating injury. 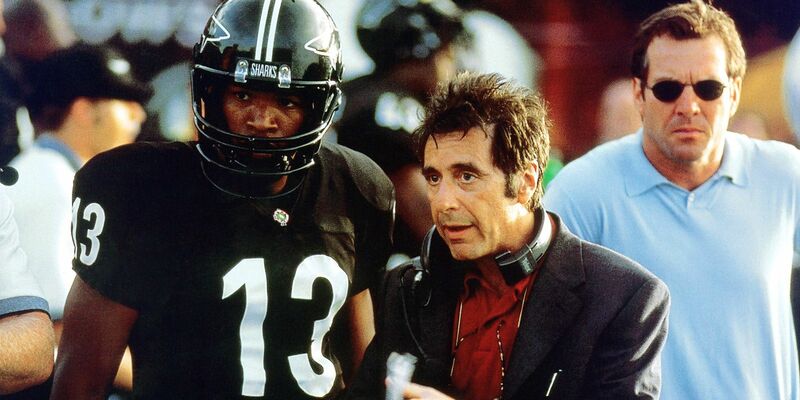 In relief of Cap comes Willie Beamen (Jamie Foxx), a talented-yet-inexperienced young quarterback. 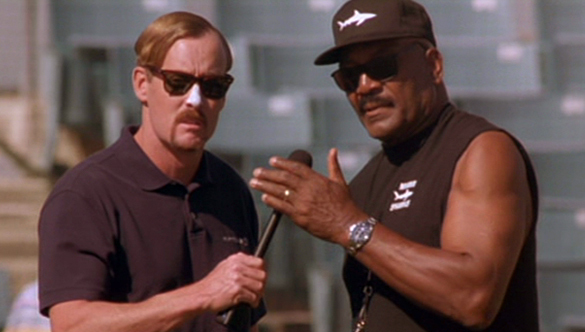 Beamen begins to lead the team to success, but also clashes with D’Amato and his no-nonsense approach. If that weren’t enough, owner Pagniacci may have had enough of the coach’s refusal to adapt to the new age. There’s an unforgiving game played on the gridiron, but the game played outside of it can be just as unforgiving, if not more so. When it comes to football movies, there are generally a few classics that are at the top or near the top of every list. Rudy, Friday Night Lights, Remember the Titans, The Longest Yard. 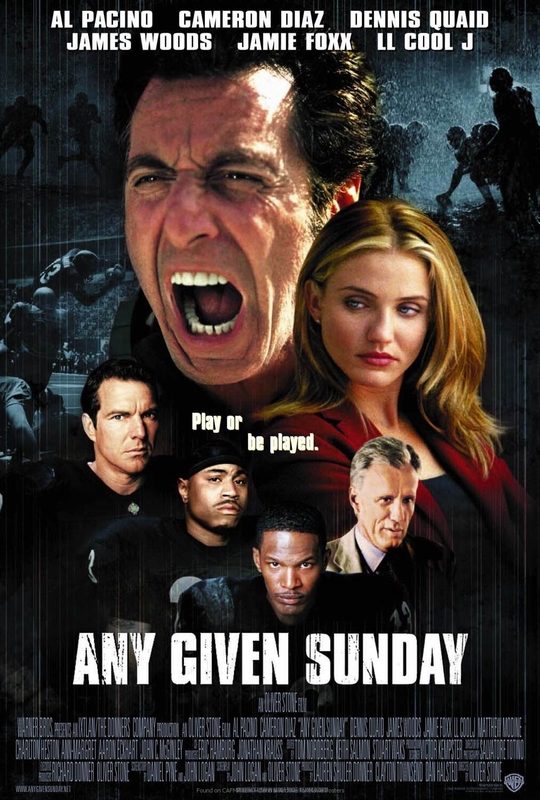 One that doesn’t get mentioned as often but in the opinion of yours truly is just as fulfilling, if not more than those aforementioned movies, is the Oliver Stone-directed Any Given Sunday. It’s a movie I loved when I was young, and one I believe gets better and better with age. Stylistically, like many of Stone’s movies, Any Given Sunday can be very hyperactive, full of cuts, splices, and the like. It is annoying in some movies, but in AGS, the style works wonderfully, in particular, the football scenes. They are so frenetic and fast paced to show that American football, in spite of all of its downtime between plays, is a manic couple of seconds when those plays are going on. Specifically, Stone captures what playing quarterback would be like stepping into a pressure cooker for the first time at the highest level of football. For my money, the opening scene when Foxx’s Beamen arrives to the line of scrimmage for the first time set to Fatboy Slim’s Right Here, Right Now is one of my favorites opening scenes of cinema ever, regardless of genre. Stone doesn’t only focus on the football, though. Any Given Sunday is just as interested in the stuff that occurs outside of the hashmarks as it is inside of them. The business side of football, the locker room side of football, and the personal side of football are all analyzed. In many ways, the issues and ideological clashes Stone brings attention to such as team doctor ethics, old-school pocket quarterbacking v.s. dual-threat quarterbacking, and whether players are nothing more than new slaves for ownership foreshadowed many hot-topic conversations that exist today in football. These stories are very compelling. But still, a major issue of the film is its runtime. Not so much due to bloating or information overload, but the random scenes Stone throws in here and there that just feel overindulgent. Spending roughly one full minute seeing players snort cocaine off of escorts, seeing a player lose an eye, and witnessing an offensive lineman having to go to the bathroom urgently make little sense as to why they had to be included. Everyone does their jobs cast-wise with what their roles ask of them. Coach D’Amato is one of Pacino’s best recent performances, which says a lot about his recent roles when one considers this was released in 1999. Despite the odd wardrobe for a coach, Pacino feels like a guy who has been around the game for a while, seen a lot of things, and is unsure about his place in the game as it becomes more modernized. Of course, his inches monologue is legendary and galvanizing. I’d say, however, that he is equaled or even upstaged by Jamie Foxx, taking on his first real dramatic role as “Steamin” Willie Beamen. Looking the part of the respective athletic position is important for any football movie, and it is easy to see Foxx’s natural athletic ability. But he’s so good next to Pacino, as a good amount of the film is the two characters coming at each other from different viewpoints. Beamen has layers; dynamic yet traditional, arrogant yet rightfully convicted in his skills. Willie Beamen is one of my personal favorite characters in any film, period. Notable actors include Dennis Quaid as the grizzled quarterback who knows about leading a locker room, LL Cool J as a selfish running back only looking after himself (his character’s clashes with Beamen feel all the more real as Foxx/LL had real issues with one another), James Woods as a questionable-at-best team doctor, Aaron Eckhart as an up-and-coming coordinator, and Cameron Diaz who really impresses as a female owner/general manager who is very much hands-on. Non-actors such as Lawrence Taylor and Jim Brown, while not exactly being stretched and for good reason, add to the proceedings and actually give the production an air of legitimacy. Any Given Sunday still serves as the truest movie representation of pro football and all of its issues that aren’t confined to the field. It might not be at the consensus very top of the draft board for football movies, but it hits just as hard in the entertainment department, if not harder than, those oft-mentioned movies at the top. Photo credits go to footballsfuture.com, esquire.com, and bluray.highdefdigest.com.